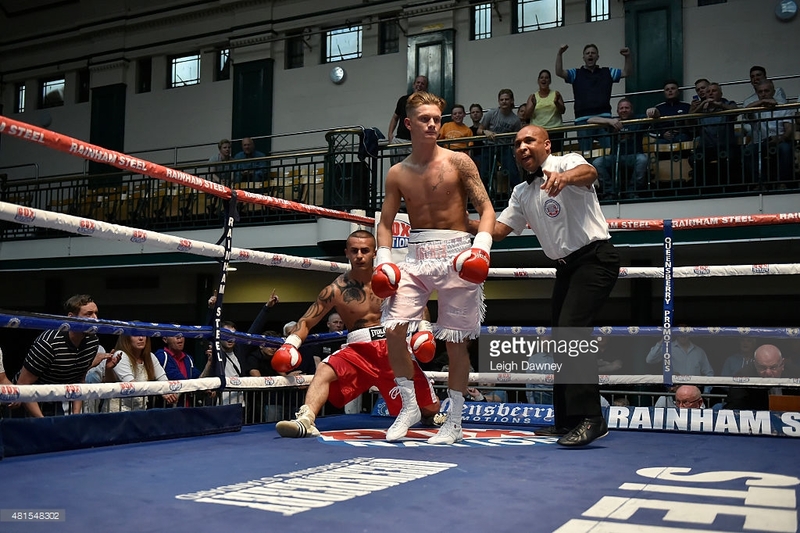 Several prospects in Britain’s talent stacked super-featherweight parish might presently profit from higher profiles but none bring better pedigree than unbeaten Sidcup skill merchant Archie Sharp. A former European schoolboy finalist and nine-time national junior champion, the 5ft 9in ‘Sharpshooter’ from Kent has quietly romped to a dozen straight wins since vaulting to the pros in July 2015. Seven victims were dispatched early, the other five failed to take a single round from him. ‘I’m only 23, only 12 fights in. When it’s my time, I’ll shine,’ insists the MTK managed starlet who showcases his wares in a scheduled eight rounder on Saturday’s fight fiesta at London’s O2 Arena. ‘I made big statements as an amateur and, in time, I’ll do the same as a pro. When I eventually hit the top, I intend staying there for a very long time. ‘Last fight, I performed alright. The kid (Spain’s Ivan Ruiz Morote) had a good record and we thought he’d have a go but after I clipped him with a few shots in the first round, he just went on his bike. I hardly got hit, won every single round clearly before finishing him in the seventh (body shots). I’m ready to step up. ‘I mixed with the very best as an amateur and I’ve always acquitted myself well sparring against the best as a pro. As a kid, I did work with the Walsh twins (British champions Liam and Ryan) plus Carl Frampton and, lately, I’ve sparred Ricky Burns, Joey Cordina and Martin J. Ward. So I’m not fazed by the prospect of fighting anyone in the UK. ‘After Saturday, I’ll have done my apprenticeship and it’ll be time to chase titles in the new season, Southern Area, English, WBO European……. I’m ready for 10 rounders now and I’m not far off 12 rounders. I’m quite happy to be chucked in the pot with any of these other prospects. ‘The one that makes most sense is Lyon Woodcock. We’re the same age, same record, same promoter. Let’s do it this September. ‘No disrespect to Lyon, I just believe I can find a way to beat any other super-featherweight. I’ve shared a ring with far better boys, several top Olympians. He’s been making very hard work, been getting bumped up, against opponents he really shouldn’t be getting hit by. Having sizzled on four arena shows at the Copper Box Arena, Chelsea fan Archie makes his O2 debut this weekend in a fourth successive scheduled eight rounder against an as yet unnamed opponent. ‘This will be my first fight with a nutritionist. Previously, I’ve been making super-featherweight way too easily. Lately, I’ve been working a lot on my power and strength. Let’s see what I can deliver at the top end of the weight,’ says the Richard Sawyer coached starlet who recently became a father to son Presley. ‘Some say I’d be better served fighting higher up the bill on smaller shows but I actually like being among all the big names at the biggest venues. I’m only a fight or so away from playing a more prominent part in more testing fights on these huge bills. You’ll see me thrive off pressure; on bigger stages against better opponents. ‘On Saturday at The O2, people will see I bring the class to this sport. You’ll see me throw and land shots that I’m not supposed to throw. I do things no one else can do. The aim of boxing is to hit and not get hit and on Saturday I’ll deliver a masterclass.